 Leading Edge Technology - each lubricant embodies the most advanced technology, providing superior, longer-lasting performance, and protection against wear and corrosion.  Application-Specific - each lubricant's viscosity and formulation is designed for its specific application.  Compatibility - each lubricant is compatible with conventional petroleum-based oils, avoiding potential gumming problems associated with some synthetics.  Easy Application - each lubricant is packaged with a dispensing system that allows convenient application to the most difficult-to-reach lubrication points.  Application Guide - an easy-to-follow application guide is available that clearly describes the proper use of each product. 4. LIGHT SLIDE OIL - Formulated for tighter fitting valve slides and valve slides of longer length. PN: H4-LSO-22. 5. SLIDE OIL - Original formula (Tuning Slide Oil). Medium viscosity for most first and third valve slides. PN: H5-SO-22. 6. HEAVY SLIDE OIL - Designed for looser fitting valve slides and valve slides of shorter length. PN: H6-HSO-22. 7. SLIDE-GEL - This special tuning slide lubricant provides long-lasting seal and firm slide motion. A premium, hi-viscosity product that will not bunch-up in the ends of slide tubes. Adhesive formulation protects slides against corrosion and wear. Packaged in 22 ml bottles with special dropper tip applicator. See USG No. 9 for additional application. PN: H7-SGL-22. 8. PREMIUM SLIDE GREASE &endash; A long-lasting slide lubricant of heavier consistency, this premium slide grease keeps slides airtight and moving smoothly. Packaged in 10 cc jars. PN: H8-SGR-10. 9. ULTRA SLIDE GREASE - A unique slide grease of extra-heavy consistency designed primarily for instruments with loose fitting slides. Perfect alternative for vintage instruments with corroded slide tubes that run the risk of splitting or cracking when being expanded. This tacky grease keeps slides in place and airtight. Resists breakdown. May be used together with Slide-Gel to obtain the desired "feel" or "pull" of one's slides. Packaged in 10cc jars. PN: H9-USG-10. Hetman® Lubricants offers a special multi-purpose synthetic lubricating grease packaged in a precision 10cc syringe applicator for a multitude of woodwind and brasswind applications. 10. MUSICAL INSTRUMENT GREASE - This unique product features a nontoxic, synthetic lubricating grease packaged in a convenient, sealable, dispensing syringe. Woodwind and Brasswind applications include: flat springs and tracks (bronze & steel), pivot screws, clamp screws, wing screws, sax neck screws, linkage joints, lever hinges, ball joints, and threads (valve stems, valve caps and screw bells). In addition to superior wear protection and extreme pressure performance, this plastics-safe, synthetic grease is waterproof and helps to prevent rust. 10 cc syringe applicator. PN: H10-MIG-10. 11. LIGHT ROTOR - Formulated specifically for close tolerance rotors. PN: H11-LR-22. 12. ROTOR - Designed for instruments with rotors having average clearance. PN: H12-R-22. 13. LIGHT BEARING - Designed for close tolerance spindle bearings. PN: H13-LB-22. 14. BEARING & LINKAGE - Formulated for instruments with spindle bearings of average clearance. This lubricant is also an excellent choice for spherical rod end bearings (e.g. "Minibal" and "Unibal" linkage joints) and other linkage components (see linkage application below). PN: H14-BL-22. Linkage and Ball Joint Lubricants: Hetman® Synthetic Linkage and Ball Joint Lubricants are formulated for superior performance and protection of rotary valve linkage components: spherical rod end bearings (e.g. "Minibal" and "Unibal"), linkage joints, cross joints, lever hinges and ball joints. These lubricants combat wear; provide for positive, quiet actions; and prevent corrosion of linkage components. These formulations are nontoxic, and non-damaging to plastic components and rubber bumpers. Packaged in 22 ml precision needle oilers. 14. BEARING & LINKAGE - For spherical rod end bearings (e.g. "Minibal" and "Unibal"), linkage joints, cross joints and lever hinges. Also recommended for rotary valve spindle bearings (see spindle bearing application above). PN: H14-BL-22. 15. BALL JOINT - A heavy viscosity lubricant designed specifically for ball joints. This synthetic quiets noisy joints and assures a smooth action by functioning as both a lubricant and a vibration dampening agent. Although formulated for ball joints typically exhibiting looser tolerances, this lubricant has found wide use on pivot screws, worn linkage components, screw bell threads, valve stem threads, and valve cap threads. Will not harm plastic joints. PN: H15-BJ-22. Hetman® Synthetic Key Lubricants are specifically designed for musical instrument keys that utilize hinge tube and rod construction. These high technology lubricants provide superior key action by establishing a tenacious, synthetic lubricating film between the hinge rods and hinge tubes. This protective synthetic layer reduces friction and wear, prevents corrosion of hinge rods, dampens sympathetic vibrations, and quiets noisy keys. The choice of three viscosity grades (Light, Medium, and Heavy) allows the professional to maximize the performance of the instrument's action by selecting the lubricant grade that is best suited to the instrument. The use of the proper viscosity key lubricant ensures an action that is quick, crisp, smooth, and quiet. Hetman® Synthetic Key Lubricants are nontoxic, long-lasting, non-gumming, and plastics-safe. Each lubricant is packaged in a 22 ml precision needle oiler dispenser making application simple, neat, and efficient. 16. LIGHT KEY - A light viscosity synthetic lubricant formulated for instruments with close tolerance actions. Frees sticking keys by penetrating into hinge tubes. Provides for a smooth, quick action. PN: H16-LK-22. 17. MEDIUM KEY - The preferred key lubricant for most instruments. The viscosity of this synthetic is best suited to actions of average tolerance. Keeps keys moving quickly, smoothly, and quietly. PN: H17-MK-22. 18. HEAVY KEY - A synthetic key lubricant engineered for instruments with worn actions and instruments that characteristically exhibit greater action tolerance. Quiets noisy keys and dampens sympathetic vibrations without slowing the instrument's action. PN: H18-HK-22. Hetman® Lubricants offers a special clear, nontoxic formulation for woodwind corks. Packaged in 22 ml bottles with special dropper tip applicator. 19. PREMIUM CORK LUBRICANT - A long lasting, premium cork lubricant that provides for smooth, positive tenon joint assembly while ensuring long cork life. Preserves joint corks without causing build-up or caking. Special dropper tip applicator makes dispensing neat and easy. Also recommended for ligature and sax neck screws. PN: H19-C-22. 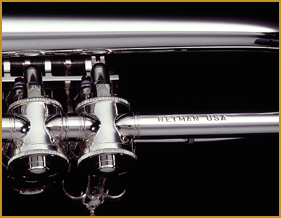 Hetman® Lubricants offers a unique water-soluble spray concentrate, and applicator for trombone slides. Hydro-Slide concentrate is formulated to be mixed with water in various concentrations thereby accommodating the particular characteristics of the artist's trombone slide. 20. HYDRO-SLIDE - slide spray concentrate and applicator for trombones. When added to water, Hydro-Slide forms an extraordinary lubricating fluid. It is designed to be used with or without slide cream to for an unusually smooth slide action. Follow the directions on the Hydro-Slide applicator bottle. Fill the applicator bottle with water to the "water line" then add Hydro-Slide concentrate to the desired level (1:40, 1:20 or 1:10). Mix thoroughly and spray on the trombone slide as needed. ©2003 Hetman, Inc. All rights reserved.